I asked myself, how do I get what I want? Intention must be reinforced by ritual in order to manifest/cross over from the quanta into reality - this is the reinforcement of eigenstates. Prayer and Ritual. Uploading the reticular activation system. Setting subconscious directives. Focusing attention, and intention. There, that's it. The magic recipe. At least it is for those of us who are fortunate enough to be living in a reality of comfort and freedom. I give thanks for my family, my husband, my son, my friends and partners on this life journey, and all those who open their lives and hearts and allow me to be witnessed at to bear witness to their growth and evolution. Tonight is a new moon. This is the New Moon for all of us to reclaim our mental space; to set limits on what gets our attention, and to carefully examine how our current diet of information is affecting our lives. This is the right New Moon to communicate your wishes, dreams and desires to those who can aid your progress. The truth is, no one does it completely alone and learning to ask for help at the right time is one of life's hardest lessons. Over the next two weeks as the Moon waxes to fullness, try to really hear what those around you have to say about your wishes, and take their advice to heart. Honest and clear communication is a two-way street and the best way to achieve a successful outcome for all. Of course for those of you who make your living in the communications/publishing field, this is the best time to initiate new projects in film, video, TV, publishing, and writing. Deal with your fear and just get the work out there! One last thing, Gemini rules change. This is the best night to work on managing your fear of change. Everything changes; it is the nature of Maya, the field of relativity. When we ride the changes and make surfing the waves of change a vehicle for success, we actualize the highest expression of Gemini. This is the New Moon to celebrate the power knowledge holds to broaden our perspective and open our minds! 1. According to my doctor's visit today, the Pod will emerge on July 11th. 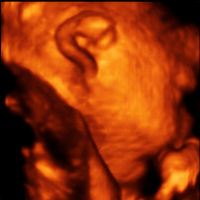 He is already very big, and the doctor wants to induce him a week early. 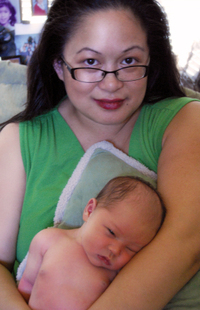 Thank You for the safe, elegant, healthy labor and delivery of my baby son. Thank you, Little Pod, for choosing me to birth and guide you into the world. 2. I've been diagnosed with gestational diabetes, and will being shooting myself up with insulin twice a day start next week, for the remainder of my pregnancy. I now monitor my blood sugar levels 4x/day and follow a diabetic's diet, with much thanks to my college roommate/nutritionist, Sylvie Nalezny. My decreased ability to produce enough insulin for me and Pod has left him working hard to process all my excess glucose, and as a result, he's gotten bigger faster. Thank you for modern medicine, and the restabilized health that is already mine. I call upon my cells to recall their state of perfect balance, and adjust and restore optimal health for me and my baby. 3. My liver and kidney tests returned normal results. Thank you liver. Thank you kidneys. For doing what you do. 4. I was fortunate enough to be thrown THREE baby showers. Everyone wants to party with the Pod! I had a lovely shower/lunch thrown for me by Ms. Jenn at work, another LA-based shower thrown for for me by my lovely almost-10 years as friends favorite RedHead Beth Manning, and a San Francisco-based baby shower thrown for me by my dear friend and professional caterer, Idit Oz. Packages from Amazon never cease, and I've received almost everything on my Baby Registry from loving and supportive friends. It's pretty amazing, and I am so blessed by everyone's generosity. I will have to lay everything we received out in the living room, Price-is-Right showcase style. My deepest thanks to these lovely ladies who took such time, care, effort and thoughtfulness to bring people together to celebrate Pod's emergence. Thank you Jonathan, Scotty, Courtenay, Trattner, Feaver. Thank you Ms. Jenn, Xenia, Elina, Melisa, Jen T, Jennifer M, Perrin, Fader, and MT. Thank you Beth, Michael, Shirley, Mama, Toni, Zandi, Nikki, Tin, Cherry, Danielle, Kuya Marc, Susanna, Charmaine, Art, Cindy, Myke, Peter, Heather, Luz, Liani and Gregory. Thank you Idit, Sylvie, Meagan, John, Jeremy and Melisa, Chris/Leo, Miri and Matt, Charmaine, Jim and Lori. Thank you family. Thank you, Podfather. Thank you. 5. I am still Jabba the Hutt. I wish I could have a prenatal massage every day. I have been yearning for a mojito, a nice pinot noir, a new corset, high heel shoes, and now even yearning for foods which I definitely cannot eat on my new diet. Thank You for the food I have available to me, the little luxuries, and the avail/ability to drink milks whenever my Pod needs it. 6. Still no name for our Baby Pod. He *has* whispered a secret name to me, but I won't share it. I have to see if it matches his face. 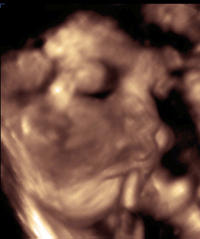 The photos here are from Pod's 4d-ultrasound. Thank you for your whispers, Pod. Tonight with the new moon I will shift my focus, the majority of it - to my health and supporting the health and graceful guidance and labor of the Pod's Emergence. Tonight with the new moon I allow all wonderful ideas which have been gestating within me to be induced and and birthed by me, in a torrent of flowing creativity. Tonight I visualize and claim the discovery and securing of the optimal place for our little family to live; the robust health and well-being of my son, my husband, myself and my family; continued progress and delightfully lucrative opportunities to use my skills and talents to support my family; an easy recovery. To all these visions I invest breaths of my own lifeforce and pluck these strings from the infinite quanta. I make space, give thanks, and hold steadfast and unshakeable faith that as I imagine, meditate, pray and invoke, that these things must be so, because I WILL it, I WISH it, I SEE it, IT IS. The good news is the T-square between Uranus/Mars in Pisces, retrograde Jupiter in Sagittarius, and Venus in Gemini will create powerful conditions for expanded levels of open-mindedness, compassion, and generosity of spirit to be inwardly experienced and outwardly expressed. This is going to be an incredible Full Moon to heal old and new wounds of all kinds and will make the call for sanity more likely to be met by real action. The Full Moon in Scorpio is the night for full disclosure. It is the night to empower ourselves by naming our truth and shouting it from the rooftops. This is the Full Moon to celebrate our right to know. Though your merriment can take many forms, it should be done with others. It may only take one person to uncover a secret, but it takes many people working together to break the spell of illusion and denial. Use this day to effectively deal with workplace power/control issues that have festered under the surface of daily interactions. These hurts and disappointments become a cancer that destroys teamwork and healthy corporate cultures. On this day, dealing openly is the path toward eradication. Whatever you do for your Full Moon ritual, make it count! Whether you really feel a lunar affinity, or whether you just like to moongaze, let this be a focusing point for you to gather your energies and desires, and let the moon amplify your intentions. 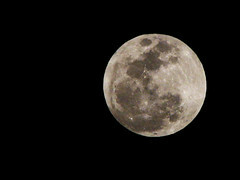 My First Full Moon Photo. Libra rules Karma (action) and it is Libra's job to give us the ability to pursue "right action". What is this principle of right action? 1. Seek justice with fairness and balance. 2. Embrace your differences without being attached to them. 3. Work to understand viewpoints other than your own. 4. Remember "the truth" is relative and based upon one's perception. 5. Initiate compromise, the basic building block of all solutions. 6. When we give a little we get a lot. When we give a lot, we get more than we can imagine. 7. Negotiation can always be the first and last response to conflict. 8. Violence is not a viable way to bring peace. Violence only begets more violence. 9. Insist on peace and non-violence. 10. When you cause pain and suffering to others, you destroy yourself in equal measure. 11. Saying and doing everything with love, compassion and respect is the only way to win. I'm doing as I always do during the full moon - which is giving thanks for all the abundance and manifestation of blessings that have occurred in my life since the new moon, and filling myself up with love, gratitude and always, more love, for everything that I have, everyone that I know, and everything I was born, built, bred and blessed to do in this lifetime. Time for the beginning of another lunar cycle. More about this new moon in Aquarius.